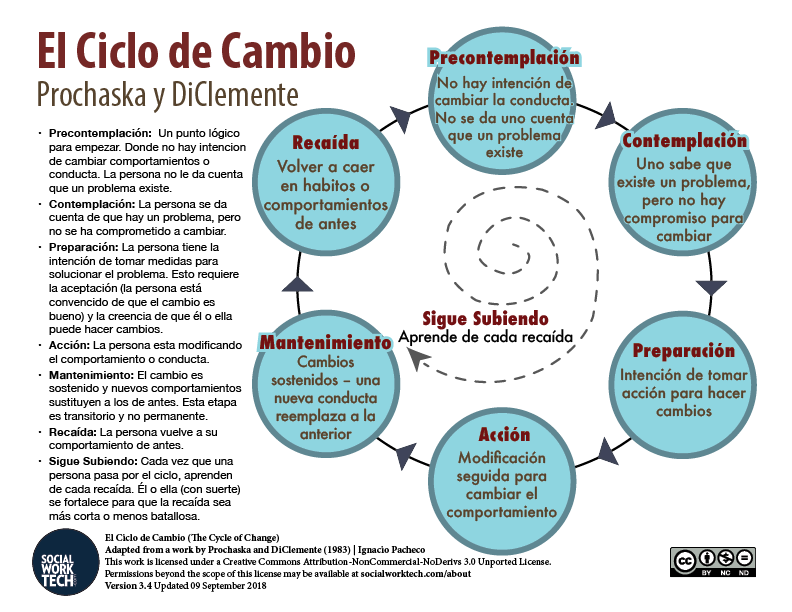 I had a request to translate The Cycle of Change I previously made, to Spanish. It should be noted that I wrote this for me to use with my clients and the dialect of Spanish that we use when we communicate. You can also download it on Social Work Tech Tools. This handout makes a great addition to your digital Social Work Tool Box (also known as the Social Work Tool Kit). I also wrote a non-scholarly narrative about this important transtheoretical model. (this was moved to my Tools page because I’m updating these regularly and all I had on here were dead links). How has this model been helpful to you in modifying your own behaviors or helping your clients move forward?